1920 – Unique auto accessory, “the demonstration”. The auto industry has always been a leader in professional selling techniques and a great exponent of the “add on sale”. This practice is historically demonstrated in this period photo as the purchaser of this 1920 Buick seems to have ticked every item on the accessory list. Nothing is known of the history of the photo but a close look at the detail reveals several things. Firstly the car itself is a 1920 Buick, model K49 – 7 passenger tourer. This is evidenced by the centre body panel between the doors, which extends above the waist line, curving over to encase the rear of the front seat with a tonneau cowl. With Buick this feature was unique to the model K49. 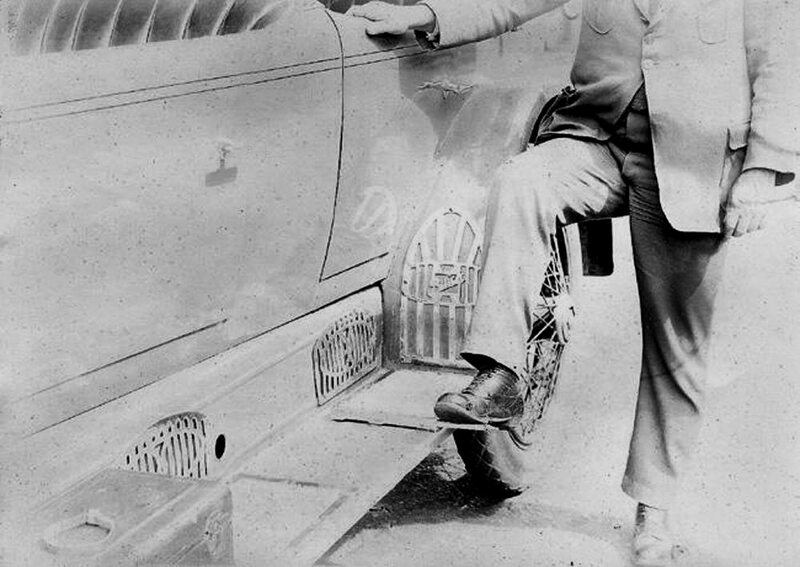 In the early 1920’s Buick offered the very stylish and expensive “Houk” wire wheels as a factory option and our owner just had to have them together with an after market running board tool box. As the other accessories are of Australian origin it becomes a reasonable assumption that our Buick was imported into Australia when new. The valance panel and rear mudguard kick plates are uniquely Australian in design and, possibly, also the running board insert mats but the “peace de resistance” must be the “shoe scraper” being demonstrated by the gentleman in the picture. This accessory is news to me having never seen one before. It appears to be fixed to the running board and has a pull out blade used to scrape the mud off the shoe. What a useful accessory, particularly as the factory specifications for the model K49 state “the interiors are finished in black leather with black carpeting in the rear and hard rubber front floor panels”.